Ilya Bryzgalov has allowed 12 goals on 91 shots through the first three games of the 2012 NHL PLayoffs, good for a save percentage of .869 and a 3.96 goals against average. And yet, the Philadelphia Flyers have one each of those games, taking a 3-0 series lead over the Pittsburgh Penguins. With the mayhem the first three games have brought, Bryzgalov’s play has been the least of anyone’s worries. But has the $50 million net-minder elevated his game enough to carry this team through the playoffs? Philly may have captured the first three games, but the series is far from over, especially against a team as talented as Pittsburgh. Bryzgalov has shown flashes of brilliance to go along with uninspiring moments. With that in mind, let’s break down each goal he has allowed in this series and see just how at fault he is for those pedestrian stats. It didn’t take long for the Penguins to get on the board. Honestly, there is not much Bryzgalov could have done about the first goal. After the shot from the point was blocked, Nicklas Grossmann grossly misplayed the bouncing puck, and Braydon Coburn allowed Crosby to break right to the night and put the puck in the top corner. Bryzgalov would have needed to make a spectacular save to keep that one out of the net. Once again, Bryzgalov is left out to dry a bit here. Braydon Coburn botches the two-on-one, and Marc-Andre Bourdon struggles to be of any help on the back check. This was not the smoothest of one timers, but any one timer from that range is a very tough save. Again, Bryzgalov would have needed to make an amazing save, but he did have some slight hesitation as he went over to make the play. This is just an ugly play by Nicklas Grossmann. There is no way Pascal Dupuis should be able to get a stick on that puck from that range. Bryzgalov gets a piece of this puck, but it took a really strange bounce and ends up in the back of the net. While he likely wanted this one back, it’s tough to entirely blame Bryzgalov for this one. A rocky start to the game for the Flyers set the stage for the team to mount an incredible comeback against all odds. A pair of goals from Briere got the team back in the game, but don’t discredit Bryzgalov’s role in the comeback. He overcame some big time mental adversity to stay focused and sharp for him team in the final two frames and overtime. His mental focus increased as the game went on and with that focus, Bryzgalov was a much more comfortable goaltender down the stretch. A one-timer from the best player in the world 15 second into the game? It doesn’t get much more difficult for a goaltender. There were plenty of Flyers to blame for this goal, but Bryzgalov was not one of them. Nicklas Grossmann takes a penalty to put the Penguins on the powerplay, which spells bad news for the Flyers. Chris Kunitz redirects a pass from Evgeni Malkin, putting the puck by Bryzgalov for a 2-0 Pittsburgh lead. On this goal, Bryzgalov goes to the paddle-down technique far too quickly. By doing so, he gives away a lot of the net and eliminates his ability to move the right side of his body. It was a subtle mistake. but it was enough to allow a goal. Bryzgalov needs to make himself bigger on a play like this, taking away as much of the net as possible. The Flyers need Bryz to be a penalty killer, too. We interrupt the regularly scheduled program of highlighting Bryzgalov’s blunders to show what may have been the save of the year. Kris Letang has a wide open net, but Bryzgalov stretches out to make a stunning glove save. Under normal circumstances, this is an incredible save, but to make it even bigger, it kept the Flyers within two goals. And shortly after this save, the Flyers narrowed the gap to 2-1 and would go on to win the game. Regardless of his mistakes, Bryzgalov altered the momentum of the series by making a save very few goaltenders in the world can make. Give him credit for that. Paul Martin wrists a shot by Bryzgalov’s right pad after taking a drop pass from Sidney Crosby. This is another save that Bryzgalov has to come up with. Bryzgalov is at his best when he is confident and aggressive. On this goal, he is neither confident or aggressive. Martin’s shot was a good one, but Bryzgalov makes the big bucks for a reason. Evgeni Malkin and company mount a quick attack to regain the lead on this goal. Somebody has to pick up Chris Kunitz, who had a wide open lane to a wide open net. But Bryzgalov isn’t entirely free of blame. Better rebound control would have nipped this play in the bud. 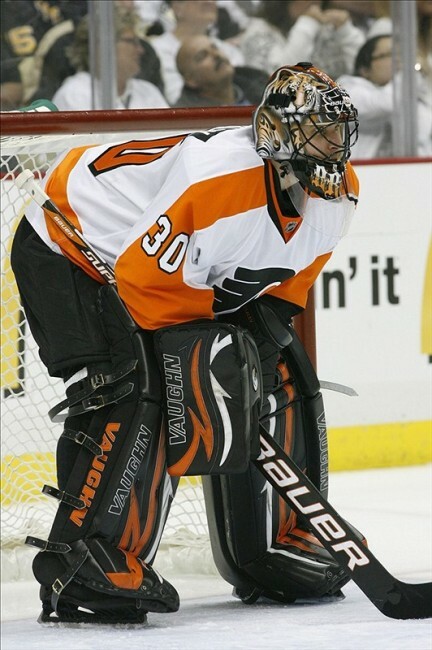 Still, I’m going to give Bryz a pass on this one. This is the type of goal that Bryzgalov needs to eliminate going forward.On a point blank backhand shot, Bryz does a horrendous job of sealing the ice, allowing his stick to come up and open his five hole. At this juncture in the hockey game, Bryzgalov absolutely has to make this save to keep the game tied. The Flyers have allowed the first goal in every game on this series, and Bryzgalov made it an easy one for Staal on Sunday. It may have been deflected on it’s way to the net, but regardless, Bryzgalov needs to keep his elbow tight to his body in order to seal that hole. And yet again, this is a puck that Bryzgalov needs to keep out of the net. He makes the initial stop, but thinking he has deflected it to the corner, Bryzgalov pops up. The issue is that the puck was between his legs, and when he got up, it squirted into the back of the net. He needs to be able to feel that puck. It was an unfortunate goal for him to allow, but he needs to avoid these momentary lapses of focus. James Neal made the Flyers defense look foolish on this play. Bryzgalov could have come up with a big save had he forced Neal to make the first move. Instead, Bryz showed his hand by moving his hand up his stick, allowing Neal to bury the puck. Not many people will blame this one on Bryzgalov. And while I’m not about to do that either, a goalie only gets so many free passes. This is another instance of the stick issue I pointed to earlier. Bryzgalov’s stick comes up, making it very difficult for him to seal the ice effectively. It’s tough to stop a point blank shot from the slot, especially when it’s coming from one of the league’s best scorers. Bryzgalov did not get to the ice quick enough, and even if he had, the stick positioning was not there. In closing, Bryzgalov’s play has been hit or miss in the first round of the NHL Playoffs. Some of the same issues he has had all season long have plagued him in these three games. When at his best, Bryzgalov is mentally engaged in the game. He has incredible reflexes, but he needs to be confident in his abilities and play aggressively. For the rest of the series he needs to stay focused for an entire 60 minute game. The offense has carried this team so far. But at some point, Bryzgalov will have to come through. Will he be ready? Please leave feedback below. I may continue this type of feature with other goaltenders based on the feedback.